A new study using images from the Hubble Space Telescope has found that galaxies with powerful black holes at their cores - called Active Galactic Nuclei or AGN (on the left) need not rely on galaxy collisions to grow. 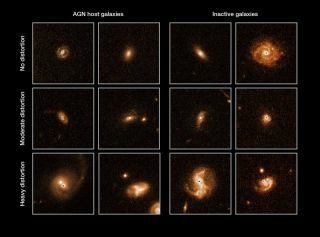 Non-AGN galaxies are shown on the right. The photos come from the COSMOS survey using the Hubble Space Telescope. A clash of titans would seem to be the perfect cause for a giant explosion, and for years scientists thought it was massive collisions between galaxies that triggered the black hole violence seen at the heart of many active galaxies. A new study suggests, however, these galaxy mergers may not be at fault, and that less obvious sources are the culprit. Our Milky Way galaxy and most others have supermassive black holes at their hearts. Some of these monster black holes are relatively calm, but others – known as"active galactic nuclei" or AGN – can spew out more radiation than our entire galaxy does, and from a patch of space no larger than our solar system. Astronomers suspect this energy is released when matter heats up as it gets sucked into the black holes. But after looking at telltale signs of galactic mergers among 140 active galaxies, as well as more than 1,200 comparable inactive galaxies, over the last 8 billion years, a team of astronomers found no significant link between the galaxy crashes and black hole outbursts. "The implication is that the universe is not evolving in such a violent way as previously thought, at least for the last 8 billion years," research team leader Mauricio Cisternas, an astronomer at the Max Planck Institute for Astronomy in Heidelberg, Germany, told SPACE.com. The universe is thought to be about 13.7 billion years old. Cisternas and other scientists analyzed galaxies from the COSMOS survey, which investigates an area of sky comprehensively mapped by Hubble and other telescopes at different wavelengths. In that area, which is roughly 10 times the area covered by the moon, they identified active galaxies by using X-ray observations from the European Space Agency's XMM-Newton space telescope, and studied them in greater detail with optical images taken by the Hubble Space Telescope. For each of the active galaxies the researchers inspected, they chose nine comparable nonactive galaxies of roughly the same cosmic age and thus stage of evolution. (One can estimate how old a galaxy is by figuring out its distance from us in light years; knowing how many years it took the galaxy's light to get here can tell you its age.) They examined all these galaxies for evidence of mergers. "You can usually tell when galaxies have been involved in a merger," said researcher Knud Jahnke, a astronomer at Max Planck. "Instead of the neat, geometric spiral or smooth elliptical shapes you usually see in Hubble images, colliding galaxies typically look distorted and warped." None of the experts' findings established a significant link between a galaxy's activity and its involvement in a major merger. The researchers concluded that the cause of at least three-quarters — and possibly all — of active galactic nucleus activity over the last 8 billion years must have a different explanation. "We do not rule out that mergers actually might cause AGN activity in some cases," Jahnke told SPACE.com. "But they do not dominate the buildup of black hole mass over the last 8 billion years." Not every major galactic collision has to result in gas falling into the black holes at the centers of galaxies, Cisternas said. For example, he explained, gas can get stalled at some point as it gets drawn toward the cores, and is kept far away from the black hole. "Another possibility is that due to the violence of the merger event, a relevant fraction of the gas is simply stripped away," he said. So what might have caused the violence witnessed in active galaxies? Potential culprits include collisions of molecular clouds, instabilities within galaxies, or gravitational disruptions by other galaxies flying by. Any of them could have fed matter into the black holes to spike up activity. The researchers plan on looking at mergers from even further in the past to see whether they are linked with active galaxies. "At these times there were more frequent mergers, by a factor of 10 or so, and the amount of gas in galaxies was much higher," Jahnke explained. "Hence physics could be different and other mechanisms could be at work." The scientists will detail their findings Jan. 10 in the Astrophysical Journal.